The House of Wessex, also known as the House of Cerdic (Cerdicingas in Old English), refers to the family that initially ruled a kingdom in southwest England known as Wessex, from the 6th century under Cerdic of Wessex until the unification of the Kingdoms of England. The House became rulers of a unified English nation after the descendants of Alfred the Great (871 - 899) down to Edward the Confessor in 1066. Edward the Elder Alfred's son united under his rule, by conquering the Viking occupied areas, Mercia and East Anglia with Wessex. Then his son, Aethelstan, extended his authority into the north, Northumbria, above the Mersey and Humber, but this was not fully consolidated until after his nephew Edgar succeeded to the throne. This period of the English monarchy is known as the Anglo-Saxon period, because the two main branches of settlers were Angles (in Mercia and East Anglia) or Saxon (in Wessex, Essex, Middlesex, Surrey, Sussex and Northumbria); a smaller group of settlers, the Jutes in Kent, Wight and in parts of east Sussex, merged with the Saxons. Their rule was often contested, notably by the Danish king Sweyn Forkbeard who invaded in 995 and occupied the united English throne from 1013 to 1014, during the reign of Æthelred the Unready and his son Edmund Ironside. Sweyn, his son Canute and his successors ruled until 1042. After Harthacanute, there was a brief Anglo-Saxon restoration between 1042 and 1066 under Edward the Confessor a son of Æthelred, who was succeeded by Harold Godwinson, who was a member of the House of Godwin a side branch of the Cerdicings. After the Battle of Hastings, a decisive point in English history, William of Normandy became king of England. Anglo-Saxon attempts to restore native rule in the person of Edgar the Ætheling, a grandson of Edmund Ironside who had originally been passed over in favour of Harold, were unsuccessful and William's descendants secured their rule. Edgar's niece Matilda of Scotland later married William's son Henry I, forming a link between the two dynasties. A coat of arms was attributed by medieval heralds to the Kings of Wessex. These arms appear in a manuscript of the thirteenth century, and are blazoned as Azure, a cross patonce (sometimes a cross fleury or cross moline) between four martlets Or. The assigning of arms to the West Saxon kings is prochronistic as heraldry did not develop until the twelfth century. These arms continued to be used to represent the kingdom for centuries after their invention. 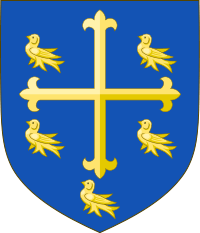 They have been incorporated into heraldic charges of institutions that associate themselves with Wessex, especially Edward the Confessor, where they are used a Westminster Abbay and in the arms of the City of Westminster. ↑ Friar, Basic Heraldry, 12. ↑ For example in Divi Britannici by Winston Churchill, published in 1675, and Britannia Saxona by G W Collen, published in 1833. Naismith, Rory (2011). "The Origins of the Line of Egbert, King of the West Saxons, 802–839". English Historical Review. 76 (518): 1–16. doi:10.1093/ehr/ceq377.